My latest book was published just a few weeks ago and has already been reprinted twice with several foreign language rights already sold. This has been a lot of fun to write. Read FREE SAMPLE of the book. Packed into it are insights from every keynote, workshop, seminar and strategy session I have done in every industry, in every nation, over the last five years. After months of preparation and research, the writing process itself was the fastest I have ever done (for a book of this length, around 110,000 words), compared to the other 15 over the years. 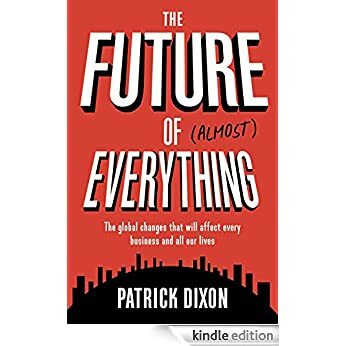 The Future of Almost Everything draws on conversations with hundreds of business leaders and specialists, all of whom are in some way building the future, driving innovation, creating tomorrow's consumer trends, influencing the shape of tomorrow's world. Some say that the future cannot be predicted. As someone who has been advising large corporations on trends for the last two decades I can say that this is foolish nonsense. Of course there are many uncertainties in life, but every corporate strategy, every business plan, every government policy, is based on fundamental trends which are usually changing relatively slowly compared to the frenetic pace of stock markets, and other highly volatile trading environments. Here is more information about the vast range of future trends covered in The Future of Almost Everything. Please send us your book AIDS ACTION to us here in chikwawa in Malawi. Please support us to translate the book into chichewa which is the second official language in Malawi after English. You may remember me from the days at asset I am now living in New Zealand with my family I am very interested in the work you do I would like to connect more and have updates from you. Is you new book of any books available as audio? Hi Charles - so great to hear from you - remember you very well from ACET days. Sorry to hear about the dyslexia. Sorry it is not yet available as an audio. I need to get round to doing it. But LOADS is available at http://www.youtube.com/pjvdixon of audio / video (which of course people don't have to actually watch - just listen. Are we linked on Facebook / Linkedin as there is something else I wanted to share....Can you contact me again using the Contact form top right of http://www.youtube.com/pjvdixon website. Thanks!